This Scottsbluff Type I point was found on the Finley bison kill site in Sweetwater County near Eden, Wyoming sometime in the 1940's. It's a spear point that dates to the Paleo-Indian period and it was probably propelled through the air with a throwing stick (atlatl). This point was classified by H. M. Wormington as a Type I Scottsbluff point. It's made of an opaque dark colored chert and measures 2 13/16 inches (7.1 cm) long. Scottsbluff points were named by C.B. Schultz and E.H. Barbour in 1932 for points of this style found with bones of extinct bison near Scottsbluff, Nebraska. Scottsbluff points have a wide distribution area. They are found in west central Canada and the Rocky mountains as far northeastward as Wisconsin and as far south as northwestern Louisiana, southwestern Arkansas, Texas and Oklahoma. There are two main types of Scottsbluff points plus one lesser variation in Wisconsin. Type I points possess triangular or parallel sided blades with weak shoulders and broad stems. Flaking is usually a transverse parallel style but can also be irregular. Type II points are nearly the same as Type I except they have wider triangular blades and have thin lenticular cross sections with more clearly defined shoulders. Scottsbluff points are diagnostic of the Cody Complex in the plains along with Eden points and Cody knives. 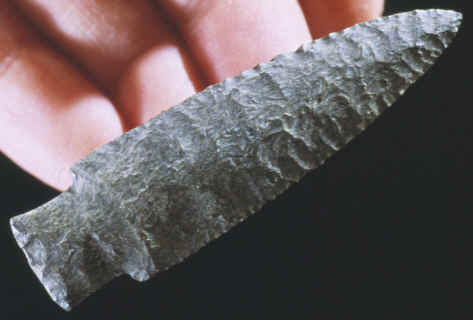 A single Scottsbluff point was stratigraphically the deepest diagnostic artifact in the Cody Complex zone at the Claypool site in Colorado, where a series of Eden points and Cody knives were found. Scottsbluff points date somewhere between 7,500 B.C. to 6,500 B.C. 1957, Wormington, H.M., "Ancient Man In North America", pp.124-127. 1978, Frison, George C., " Prehistoric Hunters of the High Plains", pp.181-188. 1985, Perino, Gregory, "Selected Preforms, Points and Knives of the North American Indians," Vol. I, p. 348. 1987, Justice, Noel D., "Stone Age Spear and Arrow Points of the Midcontinental and Eastern United States", pp. 47, 47.